The Bio-Rad C1000 Touch is a fully programmable Thermal Cycler used for PCR reactions with a user-friendly touch interface and flexible construction. The C1000 Touch houses a wide variety of blocks including 384, dual 48 well and 96 well. This PCR comes outfitted with a 96 Well FAST head, but can also seamlessly accommodate Bio-Rad CFX96, or CFX384 optical modules. The reaction blocks on the Bio-Rad PCR system are easy to change without the use of tools. Each block comes equipped with adjustable heated cover which allows for a variety of sealers and vessels such as standard PCR plates and low-profile plates. The Bio-Rad C1000 Touch offers a top shelf graphical display built on the best Icycler DNA Engine combining these two platforms makes this PCR one of the best on today’s market. In addition to reliability, the C1000 Touch thermal cycler from BioRad comes equipped with USB ports compatible with flash drives so you can easily take your data with you at a click of a stick. 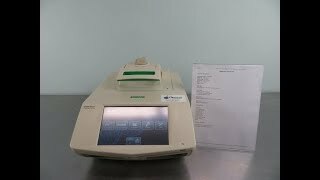 The software built in to this PCR machine is Microsoft Windows based allowing end users to quickly write their own protocols. This PCR Machine comes with a protocol auto writer that aids end users with writing fast and ultrafast standards making the entire experience user friendly. The BioRad C1000 Touch Thermal Cycler includes software which easily hand-shakes with your computer allowing to quickly transfer and save data. This gradient thermal cycler supports a variety of consumables making the C1000 Touch from BioRad the best in its class among DNA engines. The sleek design takes up a small footprint of 13” x 18” inches lab space and weighs a mere 34 pounds but packs a punch in term of PCR reaction. Some additional features include password protection of data, folders, and login. Data can easily be exported and filtered into system error logs and run logs. The software accompanying the BioRad C1000 is compatible with Windows XP (recommended) or higher. The temperature control mode of this Bio-Rad PCR uses a calculated block. These BioRad C1000 Touch PCR have been fully inspected and come with current validation reports. All of our lab equipment comes backed with our standard warranty. Should you have any questions, please don't hesitate to contact us.